For decades, the Washington, DC metropolitan region has been booming. While immense growth in employment has brought opportunity and wealth to many area residents, and attracted countless new residents, this growth has not come without cost. Rents and home prices have escalated to unaffordable levels, even for workers with steady jobs. These increases in housing costs have been especially dramatic in transit-accessible, walkable neighborhoods. The National Center for Smart Growth Research and Education investigated regional demographics and economic data in order to understand where accelerated neighborhood change, or gentrification, has occurred, and where it is likely to occur in the future. The interactive maps above are designed to serve as a tool for local leaders and policymakers who want to know more about how their neighborhoods are changing, and how they will change in the future. Gentrification is a widely used, but poorly defined concept that captures just one specific type of neighborhood change. With these maps, we hope to present a broader perspective to show interested parties that gentrification is just one specific type of change impacting the diverse range of neighborhoods in our area. This analysis utilizes data at the US Census tract level from the 2000 decennial census and the 2010-2014 American Community Survey. Census tracts in Montgomery County, Prince George’s County, and Washington, DC are included in the maps. More detailed information about the data and the methodology used to create the maps and tract categories is available in our report, Understanding Neighborhood Change in the Washington, DC Region [Link to to-be-finished report]. The map is divided into three color groups: blue, red, and green. The sharpest division is between the blue tracts, and the red and green tracts. 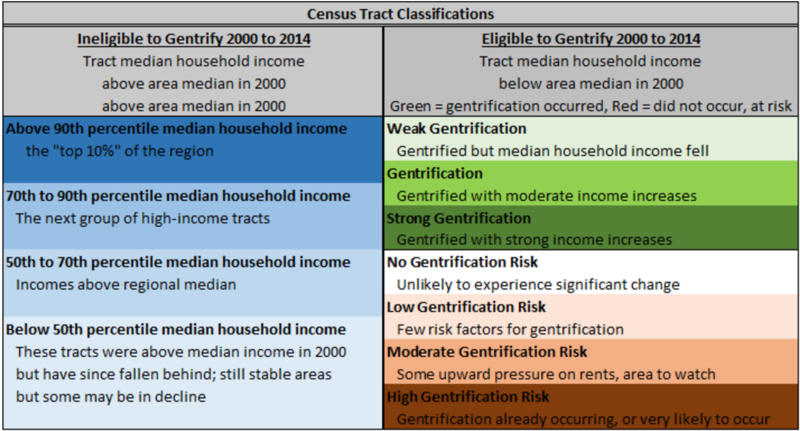 The blue ones were ineligible to gentrify because they had median household income greater than the regional median in the year 2000; the green and red ones were eligible to gentrify because they had median household incomes below the median in the year 2000. The green tracts gentrified from 2000 to 2014; the red tracts did not. The blue tracts, which were already high income, are mapped by their place on the income distribution; higher income areas are darker shades of blue. The green shades show differing rates, or strength, of gentrification. The red and pink tracts are areas that were eligible to gentrify, but did not; darker shades represent areas with higher risk for gentrification in the future. We deem tracts that were eligible to gentrify, but did not, as at risk for gentrification. The areas in red and pink on the map are at risk for gentrification, and darker shades are more at risk. Specifically, these areas are at risk for accelerated increases in home prices and an influx of educated residents because they have seen, relative to other areas: greater increases in population, the proportion of the population that is white, median household income, education levels, home values, the number of housing units, rent prices, the homeownership rate, and decreases in the poverty rate. Areas that have good accessibility to jobs, both by automobile and transit, are at a higher risk to gentrify, as are areas that are within one mile of a rail-transit station, including new Purple Line stations. Data sources include the U.S. Census, American Community Survey (ACS), Maryland Quarterly Census of Employment and Wages (QCEW), and Longitudinal Employment Household Dynamics (LEHD). Please see our downloadable data table above for more details.